KIEV, Ukraine -- Ukrainian President Petro Poroshenko has said he will consider allowing an international aid mission into rebel-held areas of eastern Ukraine after pro-Russian separatists called for a case-fire to avert a "humanitarian catastrophe." Ukrainian government troops sit atop of their military vehicle in Donetsk region. However, Poroshenko insisted in a statement released late Saturday that any aid to the region must only enter through checkpoints manned by the Ukrainian army and not be accompanied by any military force. Poroshenko also told Vice President Biden in a telephone conversation about his communications with the Red Cross about efforts to distribute humanitarian aid, the White House said. A White House statement said Biden and Poroshenko agreed that if "Russia were serious about improving the humanitarian situation in eastern Ukraine," it had to immediately stop shelling Ukrainian troops, release Ukrainian hostages being held inside Russia and cease providing weapons to the separatists. Poroshenko also said in his statement that he and German Chancellor Angela Merkel had discussed German participation in an international aid mission. Russia has repeatedly called for a humanitarian mission to be sent into eastern Ukraine. However, Kiev and Western leaders are concerned that any aid mission could be used as a pretext for Russia to send in troops. U.S. and NATO leaders have claimed that approximately 20,000 Russian forces have massed near the border between Russia and Ukraine. Moscow, as always, has denied the Western claims. Earlier Saturday, the White House said that President Obama and Merkel spoke by phone and agreed that any Russian intervention in Ukraine, even under humanitarian auspices, would violate international law and "provoke additional consequences." Obama and British Prime Minister David Cameron also spoke by telephone on Saturday about Ukraine. 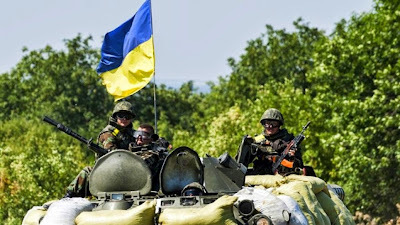 "Both expressed grave concern about reports that Russian military vehicles have crossed the border into Ukraine and that Russian armed forces are exercising for a 'humanitarian intervention'," said a statement from Cameron's office. Both "are absolutely clear that such a so-called humanitarian mission would be unjustified and illegal." Aleksandr Zakharchenko, the so-called prime minister of the Donetsk separatists, said in a statement on a rebel website Saturday that the city of Donetsk had been surrounded by Ukrainian government forces, who had captured the town of Krasnyi Luch and effectively cut off Donetsk from the rest of the region. A spokesman for the Ukrainian military operation, Colonel Andriy Lysenko, told reporters Saturday that he could not confirm that Krasnyi Luch was under government control. Donetsk, the last major city under control of the rebels, was home to an estimated 1 million people at the start of the conflict. However, over 300,000 are believed to have fled the city, which has come under heavy artillery fire in recent weeks as government troops approach. At least one person was killed and 18 wounded in shelling that hit about 30 apartment blocks Saturday in Donetsk, he said, adding that about 2,000 residential buildings had no electricity. City streets were nearly empty of cars and pedestrians and most stores were closed. Explosions were also heard near Donetsk's airport. Ukrainian officials have consistently denied that their forces are shelling civilians, but the rebels dismiss that and claim the government is aiming to blame the insurgents for the increasing death and destruction. Ukraine says the rebels have deliberately put rocket launchers in populated areas. Novorossiya, or "New Russia," is a term widely used by the rebels for the eastern area that seeks independence from the government in Kiev. Horlivka, where rebels and Ukrainian forces are also fighting, is 20 miles north of Donetsk. Concerns were also rising about a possible humanitarian catastrophe in the rebel's second-largest city of Luhansk, where fighting has been heavier and more prolonged. A map released by the Ukrainian military showed Ukrainian forces near the outskirts of Luhansk on three sides, with an opening to other rebel-held territory only to the south. The BBC reported that Luhansk's city council had released a Russian-language statement on its website Saturday saying that residents had been without electricity and power for a week. The statement also claimed that parts of the city of 425,000 were still being bombed and most of the shops were closed. The International Committee of the Red Cross said it was working to alleviate the crisis in eastern Ukraine but warned that any Red Cross aid convoy "will be taken in strict adherence to our fundamental working principles of neutrality, impartiality and independence."